The 2016 USA BMX National Series will be making stop number three of the pro series and stop number eight of the amateur series in Travis County at Central Texas BMX. Central Texas BMX is located at Northeast Metro Park in Pflugerville, Texas and the event is sponsored by the Austin Sports Commission. It's nice to only have a 20 minute drive to the track, but I am sure I will spend that extra time cleaning up after all the guests staying at my house. Riders from around the United States, Canada, and the world, will be traveling to Austin to participate in the inaugural national event at the state-of the-art facility. The track has been in operation for a little over a year and will be hosting its first national event. It is anticipated that there will be between 800 and 1,000 entries competing in both the amateur and professional classes. Many athletes are vying for a position on their countries 2016 Olympic Team and will be trying to better their chance while competing this weekend. Fresh off a large professional race in Argentina last weekend, many of the top U.S. Olympic hopefuls and other top professionals will be in attendance. Two-time Olympic Gold Medalist Maris Strombergs is scheduled to compete. On the amateur side, Austin, Texas boasts some of the fastest riders in the country. With six Austin riders currently nationally ranked in their age category, look for them to be getting cheers from the home crowd. The reigning USA BMX National number one cruiser, Jason Carnes (Redline Bicycles) calls Austin home and is one local rider that is happy to see a national event in Austin. "It's nice to only have a 20 minute drive, bit I will spend the extra time cleaning up after all of the guests staying at my house," said Carnes. Racing will take place Friday, Saturday, and Sunday, April 1, 2, and 3. Practice gets underway Friday morning at 8:30 AM with racing starting at 1:00 PM. Saturday racing will begin at 11:30 AM and Sunday racing will begin at 8 AM. The top pros will be in action Friday and Saturday. Racing is open to riders of all ages and skill sets. Age classes start at 2 & under with young racers making their way around a small section of the the track on balance bikes. The oldest class is 61 & over, with every age group in between. 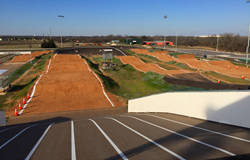 Central Texas BMX is located at 5001 Killingsworth Lane, Pflugerville, Texas. Normal race days are Thursday and Sunday, with practices held on Wednesday and Saturday. You can find more information by visiting centraltexasbmx.com. About USA BMX - The American Bicycle Association (ABA) is the sanctioning body for the sport of bicycle motocross (BMX), and also the world’s largest BMX sanctioning body. United States operations are conducted under the brand USA BMX and Canadian operations are conducted under the brand BMX Canada. As the parent organization of USA BMX and BMX Canada, the ABA governs and sanctions competition for more than 300 sanctioned BMX tracks and more than 70,000 members across the United States and Canada. ABA promotes BMX racing on several levels including: local, district, state, regional, national and international. Locally, ABA sanctioned more than 12,000 BMX races last year. Annually, the ABA organizes and facilitates a 35 race national championship series with events held across North America. These national events are held at both existing BMX tracks and in various arenas. About Central Texas BMX - Central Texas BMX is a non-profit corporation operating USA BMX sanctioned, practices, races, and clinics at the Travis County facility. The primary objective is to provide education and promote youth and adult cycling through the sport of Bicycle Motocross.